I am particularly fond of lizards, and I've seen more types of lizards than other groups of reptiles and amphibians, so it was especially hard to choose my favorite 10 of all the types I've seen. I based my choices on some arbitrary combination of beauty, size, interesting behavior, oddball-ness, and difficulty of observation. I have wanted to see a wild Thorny Devil more than any other animal in the world since I was a kid. 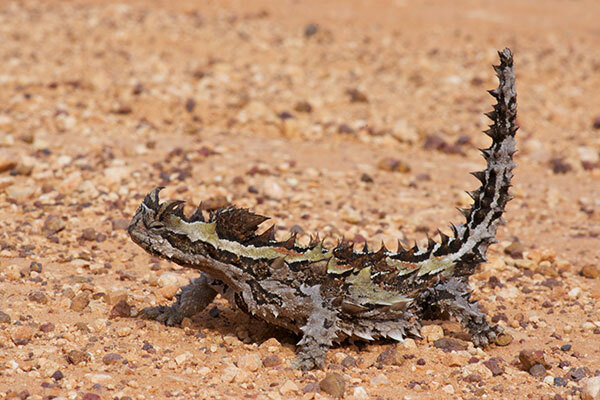 At long last, on my fourth trip to Thorny Devil territory, I found three of them. There is no weirder-looking lizard on earth. 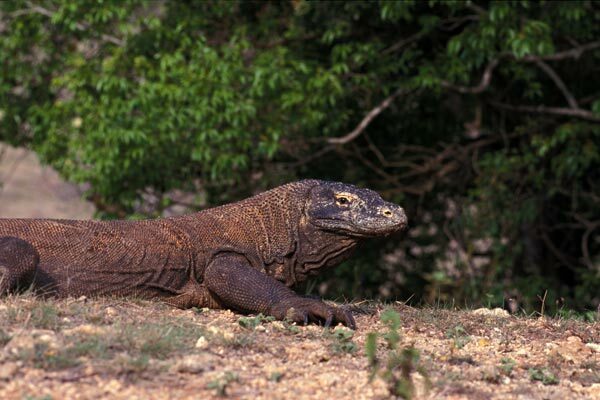 Next up is the world's largest lizard, and the only one known to attack and kill people (extremely rarely). Size? Check. Interesting behavior? Check. Difficulty of observation? Check — they live only on a few remote Indonesian islands. 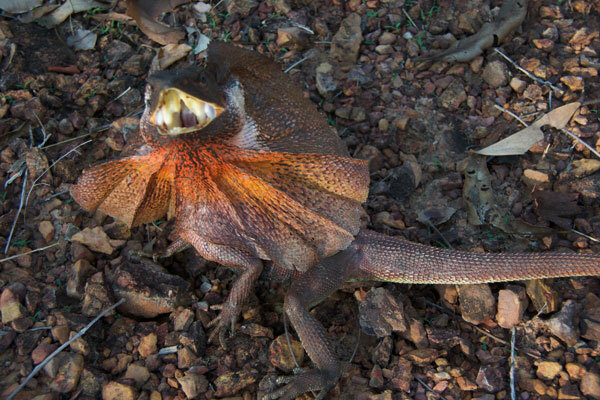 If oddball-ness were the only criterion, the Frilled Lizard of northern Australia would be on top of the list. 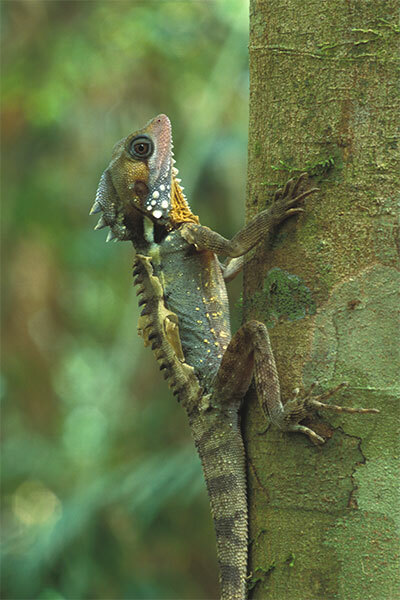 No other lizard (or vertebrate, as far as I know) has anything similar to its giant cowl of skin that it expands not as a threat to prey (despite what Jurassic Park might have you believe — what would be the point of threatening prey? ), but as a bluff to predators. It's beautiful, it's hard to find, and it's one of the world's only two uncontroversially venomous lizards. 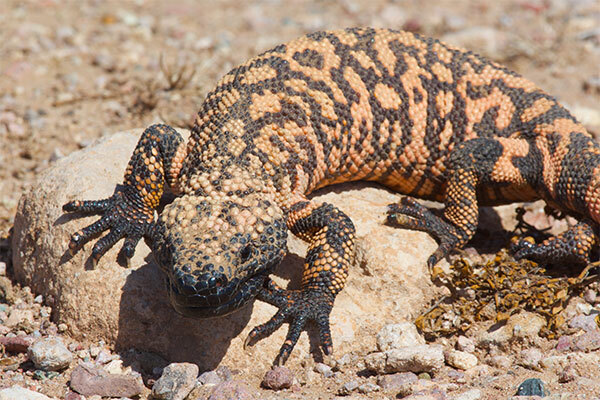 Gila Monsters are generally passive creatures, but if you were foolish enough to get bitten by one, you would have a very difficult time dislodging it. They don't call it "Fantastic" for nothing. This arboreal gecko lives in a narrow swath of rainforest in Madagascar, where it is unbelievably well camouflaged. 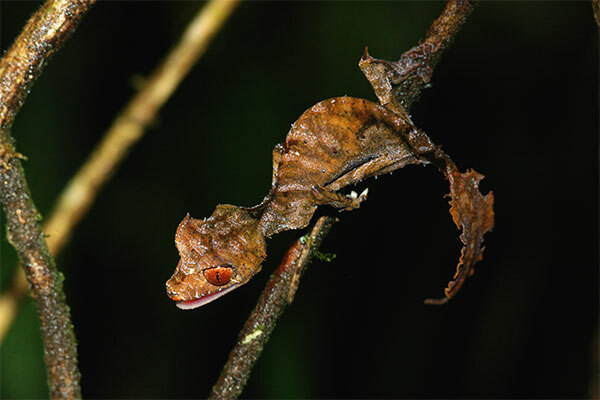 Its red eyes and the pointy protrusions above its eyes ("supraciliary spines") have earned it the alternate name "Satanic Leaf-tailed Gecko". 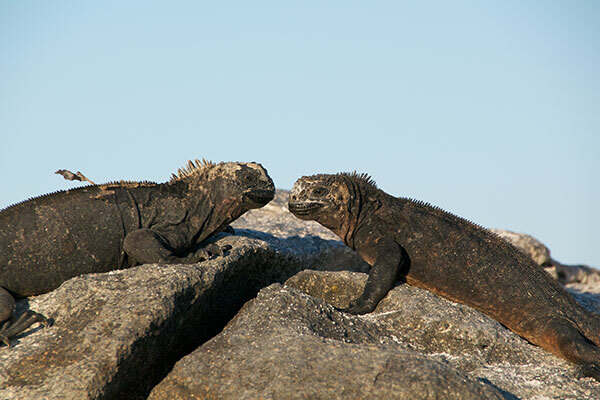 The only lizard known to forage beneath the ocean's surface, the Marine Iguana is one of the iconic species of that cradle of evolutionary thought, the Galápagos Islands. Charles Darwin marveled at their ugliness, but he wasn't such a looker himself. He also threw one into the ocean repeatedly; scientific experiments were simpler back then. 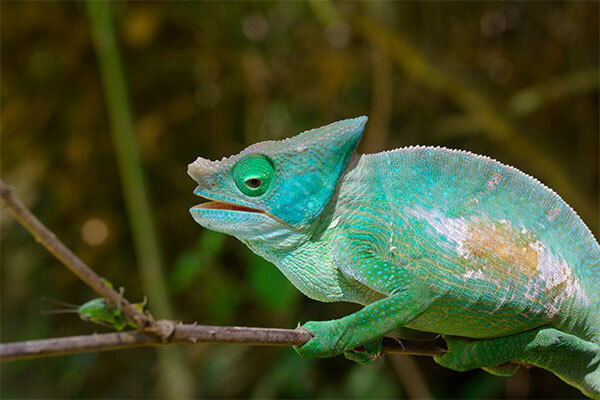 Chameleons, those googly-eyed masters of changing colors and gripping thin branches, obviously belong on any sensible list of favorite lizards. I chose this species because it is one of the world's two largest chameleons, and is more colorful and much less common than the other one (Oustalet's Chameleon). Both species live in Madagascar. This very large goanna (Australian for "monitor lizard") is not as massive as its cousin the Komodo Dragon, but it is far more beautiful and much more active. 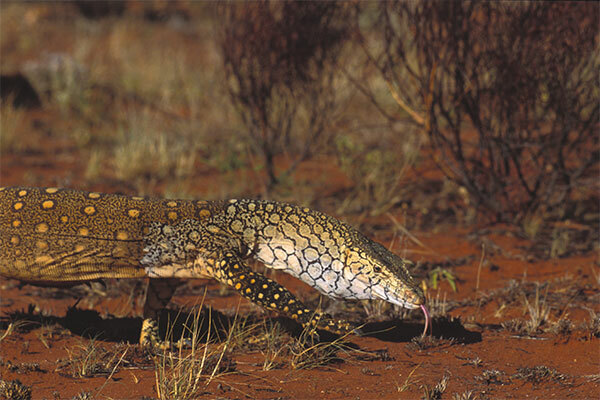 Whereas Komodo Dragons tend to sit around waiting for their prey to wander near, Perenties turn on the speed and chase theirs down. This dramatic-looking lizard is found only in the rainforests of northeast Queensland, Australia. Its small range, significant size, elusive behavior, and colorful appearance have made it a symbol of the area's biodiversity. These same attributes have earned it a spot on my favorite lizards list. The adult male Emerald Basilisk is big and bright green and sports crazy sails and headgear that make it look like a dinosaur as designed by Timothy Leary. 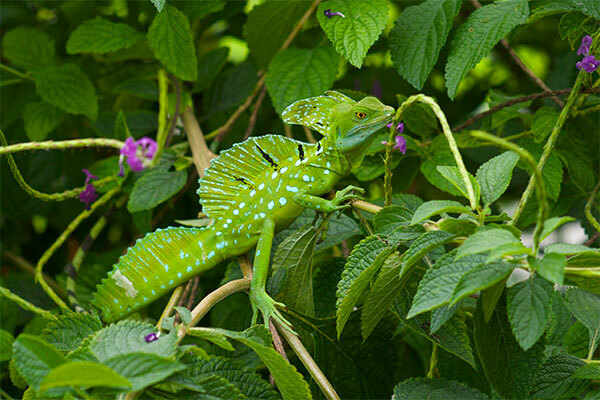 They can be common in the right habitat in Central America, but they are not always easy to see when they blend into the lush tropical foliage. And did I mention that they can run across water?